Alberta. Dept. of Education. Annual report. Edmonton: Alberta Department of Education, 1906-1972. Physical description: 67 v. : ill. ; 27 cm. Annual. Some volumes accompanied by supplements. Report for 1973 issued by Alberta Education under the title Annual review. From 1974 to 1995, issued under the title Annual report. Reports for 1996 and 1997, issued under the title Annual report and ... annual results report. Reports for 1998 and 1999, issued under the title Alberta Education's ... annual report and ... annual results report. Report for 1999/2000 available online at http://education.alberta.ca/department/annualreport/archive.aspx [6 June 2009]. In [1999? ], the report merges with that of an agency dealing with post-secondary education and career development to form the annual report of Alberta Learning. These reports - Communications Branch, Alberta Advanced Education and Career Development, Annual report, [Edmonton]: Communications Branch, Alberta Advanced Education and Career Development, 1994-1999 and Alberta Learning, Annual report, Edmonton: Alberta Learning, 2000-2004 - are described separately in the bibliography. Subsequently, however, responsibility for post-secondary education is again assigned to other departments and the annual report of Alberta Education is reconstituted. From 2005 onward, issued by Alberta Education under the title Annual report. These reports are available online at http://education.alberta.ca/department/annualreport/archive.aspx [6 June 2009]. Continues, in part, the annual report of the Department of Education of the North-west Territories. Prior to the entry of Alberta and Saskatchewan into Confederation in 1905, these regions were administered under the jurisdiction of the North-west Territories. 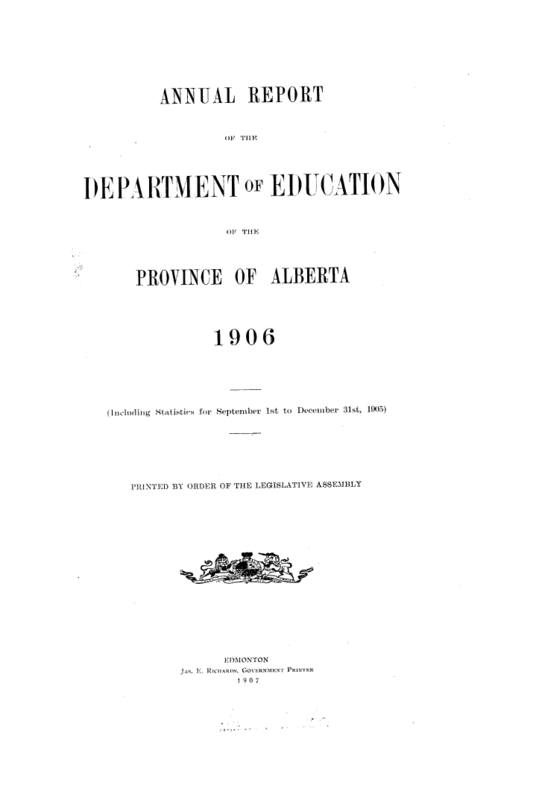 The reports of the Territorial and Saskatchewan education departments - Department of Education of the North-west Territories, Statistical report of the Department of Education of the North-west Territories, [Regina]: Department of Education of the North-west Territories, [1905?] and Saskatchewan Department of Education, Annual report, Regina: Saskatchewan Department of Education, 1907-1986 - are described separately in the bibliography.